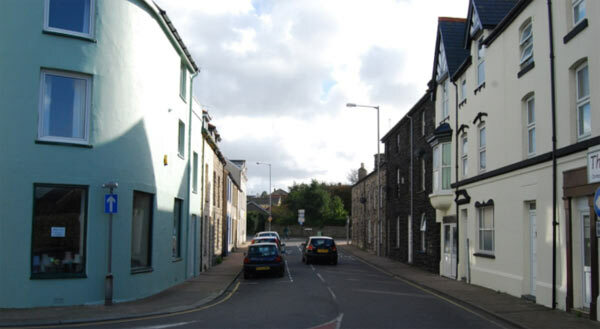 A market town and holiday resort which now forms a sub-regional centre for southern Gwynedd. Its origins appear to lie with its parish church, and as the name ‘Tywyn' (sea-shore or sand-dune) suggests, it is probable that when it was founded it was near the water's edge. It may have been the principal ecclesiastical centre of the south-western part of Gwynedd. A villa de Tewyn is recorded in 1283, implying the beginnings of urban life but it was never a planted borough town and seems to have evolved around the church. The market seems to have grown up around the church and Corbett Square . Visitors record uniformly negative judgements of the place until the early nineteenth century, when it began to expand under the patronage of the Corbet (and from 1878 the Corbett) family of Ynysymaengwyn. From the 1860s it was served by the national rail network, and boasted civic infrastructure in the form of gas supply. By this stage it had pretensions to becoming a holiday resort, and boarding houses were springing up. The purchase of the Ynysymaengwyn estate by John Corbett in 1878 led to further investment in the town, including the development of the water and sewage system, the building of the promenade, the assembly room of 1893 (now the cinema), the Intermediate School of 1894 and the market hall of 1897. The High Street was developed slowly from the 1860s to the 1960s, and villa-type housing made its appearance particularly in the southern part of the town. From August 1941 and May 1945 an RAF camp was established at Tywyn, taken over by the army at the end of the war. The runways have disappeared but many of the buildings are extant, as are services personnel married quarters, semi-detached dwellings to the north of the camp, now in private hands. The revival of the Talyllyn Railway in 1951 placed Tywyn on the tourist map once again. The town acquired a supermarket on the site of the former main-line goods yard in the late twentieth century, a hospital, a leisure centre and an industrial estate on the road near Pendre. A proposal for a marina sea-front development was turned down but there has been considerable new build on the Promenade area. Tywyn is a town of some architectural variety, and in which different street patterns are evident. The historic core of the town is characterised by small two-storey houses of possibly eighteenth century or early nineteenth century date as well as some larger double-fronted structures in the vicinity of the church and the market place. The church itself, with its twelfth century nave and Victorian transept, chancel and tower, is recognisably the historic centre of this part of the settlement, and its tower is visible for some distance away. However, the substantial Corbett Arms Hotel closes off the historic market area and dominates this part of the town. Some of the buildings facing the church are unoccupied, including Geufron House with its attractive Italianate triple window. Away from this area, the architecture varies considerably. Along High Street, which extends from the Medieval core westwards, double-fronted dwellings of Hanoverian proportions can be seen near to mid- nineteenth century terraced dwellings and a brick-built bon marché, Paige's Furnishings of 1903. The Victorian and Edwardian ambience of the western end of High Street is however dented by a modernist leisure centre. A cluster of nineteenth century boarding houses ‘Idris Villas' and on Pier Road make use of polychromatic brick patterns. Around Tywyn Wharf station, at the intersection of Station Road/Brynhyfryd Road and Neptune Road , the buildings are later, more elaborately ‘villa' in style and apt to make greater use of brick. There are extensive areas of twentieth-century housing in the town. The sea front buildings (in the area between the main line railway and the promenade) include some pre- railway stone-built vernacular dwellings of perhaps eighteenth century date, and some substantial nineteenth century hotels and apartment blocks, but dwellings are mostly post-war ‘infill', bungalows and housing estates. The apartment block ‘Trem Enlli' is particularly impressive, and preserves some of its original detailing in the form of wrought ironwork and attractive timber balconies. This area includes the twentieth-century military camps at Tywyn.